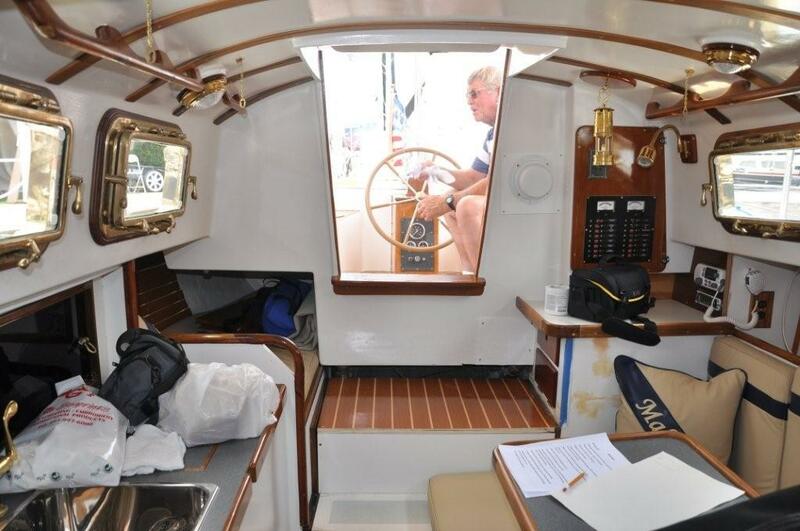 "Niels Daugbjerg writes with the same enthusiasm, when introducing his 1967 Bristol 29. 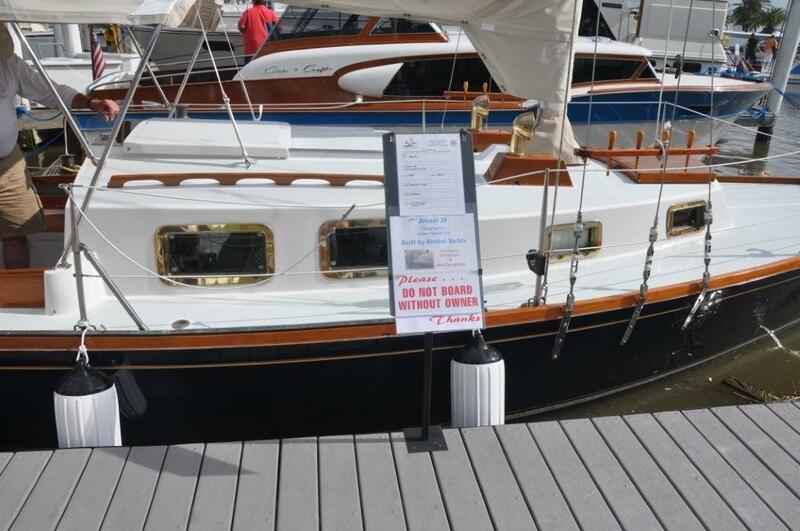 "My boat partner, Steve Kahn, and I bought this boat with the 'nasty stuff' done. 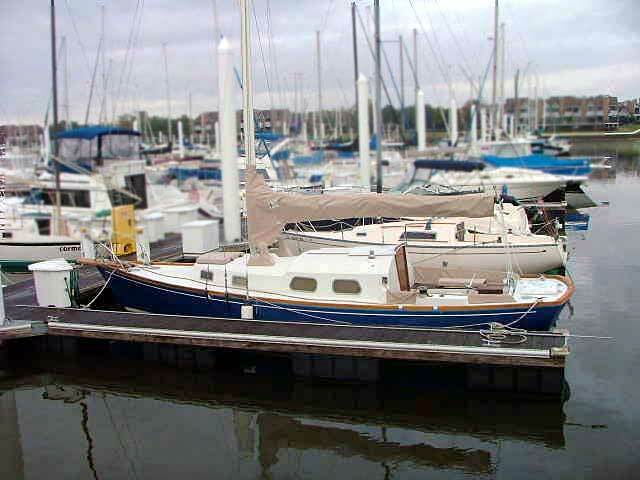 Recored deck, rebuilt Yanmar, re-rigged mast and most of the exterior wood. We are now about 90% complete. 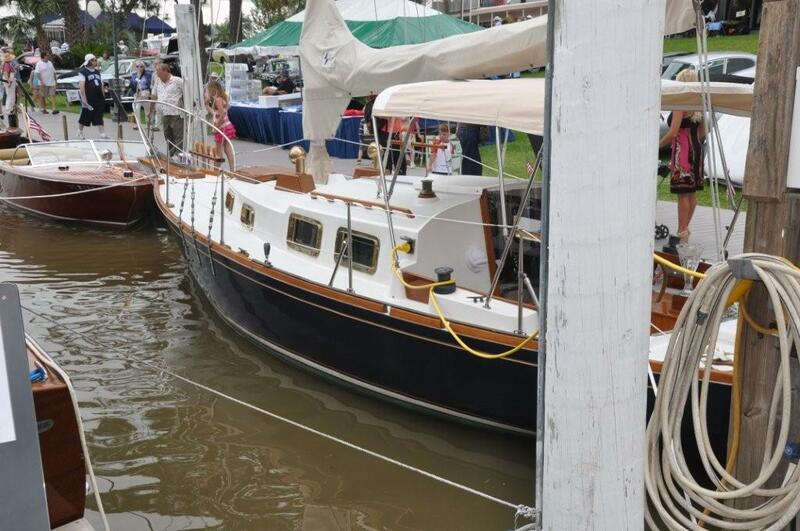 Plan to have all of the exterior work on Maloha (that means Hinckley in Hawaiian) completed in the spring of '05. 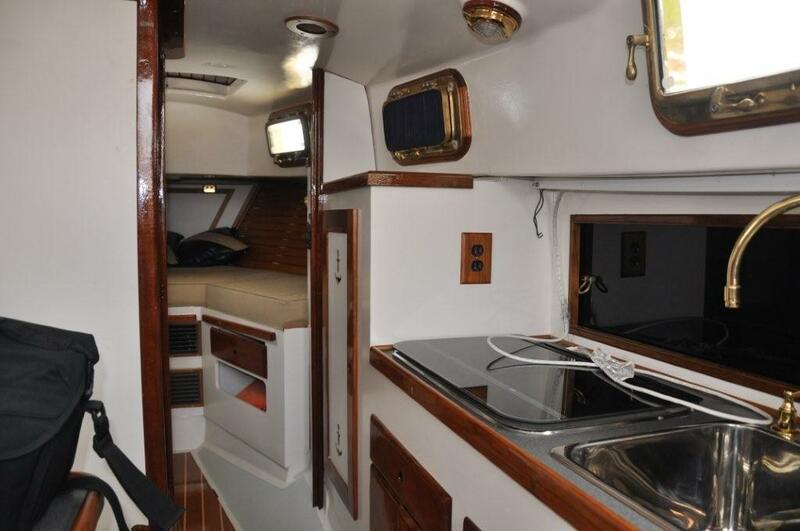 We will get in a little sailing while we finish rebuilding the interior." 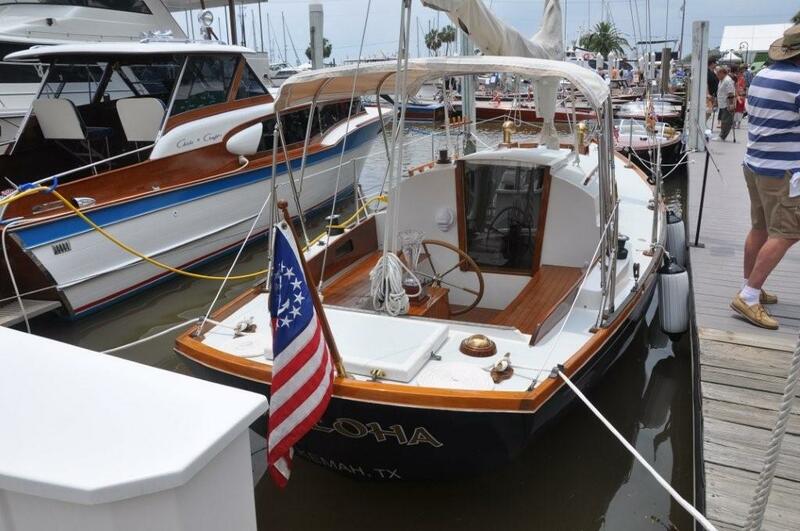 "Maloha" is a '67 and was the personal boat of Rufus Smith, the original Bristol dealer here on Galveston Bay. Rufus has been gone for a number of years but I knew him and raced against him in the late '60's and '70's. 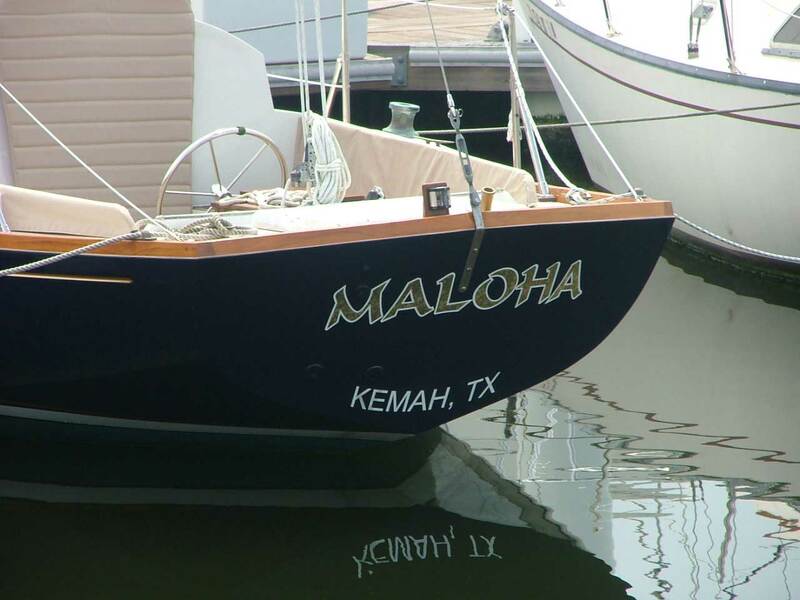 Rufus owned the boat for five years and the name "Maloha" has been on the boat since she was originally splashed. No way we'll ever change it. I'm both flattered and encouraged by your interest and will send you some more detail pics if you are interested. Made some progress since the GOB photo. She has recored deck, 2 cyl. Yanmar, repainted spars, worm gear steering from a Cape Dory 30. Having a new stem head fitting fabbed as we speak and will move the headstay to end of sprit with babystay and running backs to come. 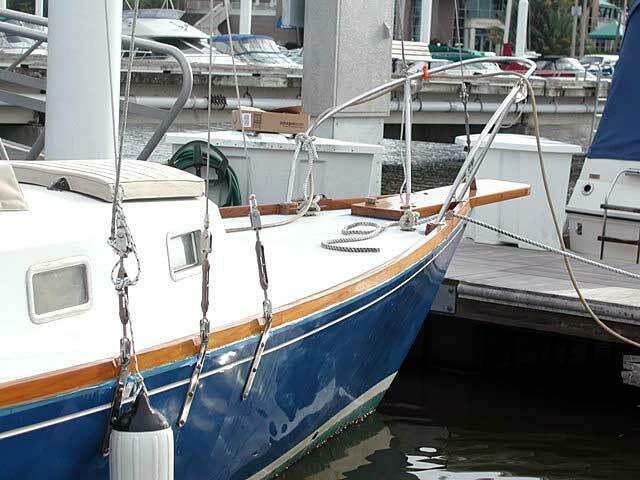 The previous owner installed new oversized rigging and led the chain plates outside on the hull. He also pulled the original toerails off and replaced them with these oversized beautiful toerails. We have 3 base coats of Cetol light and 5 coats of Cetol Clear Gloss on them. 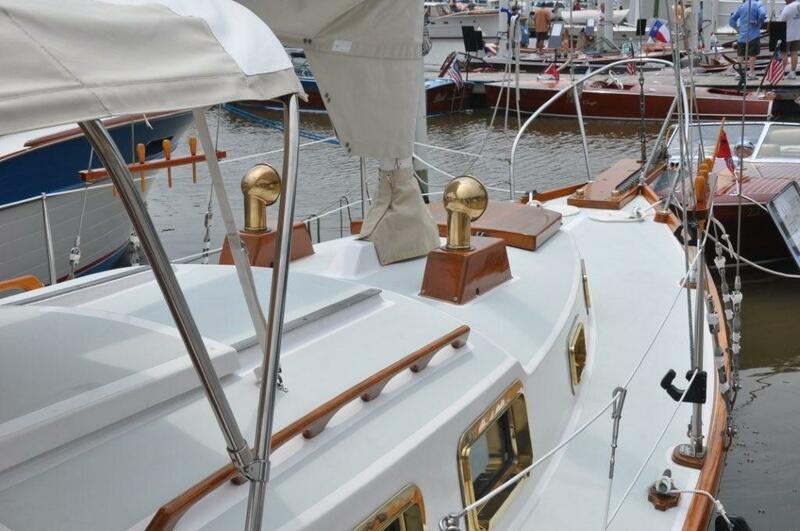 He also installed the bowsprit. The 2 plugs on the aft section are just plugs to keep water out of the ground tackle locker until we mount the anchor windless. An anchor roller will also be added onto the bowsprit. 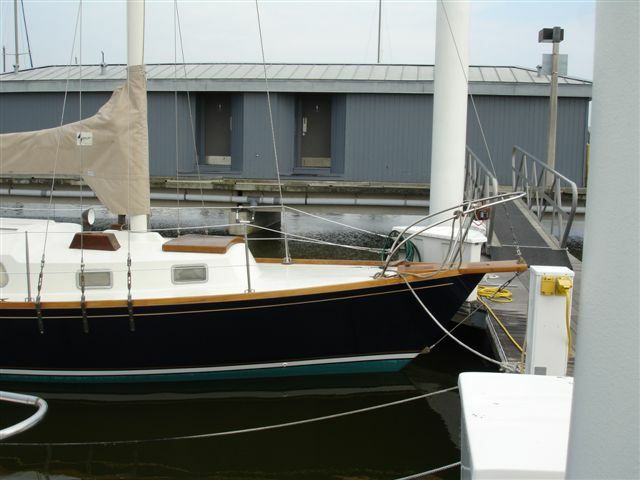 The headstay will be moved forward in the next few weeks, to the tip of the sprit so that we can use a staysail and make her a cutter rig. 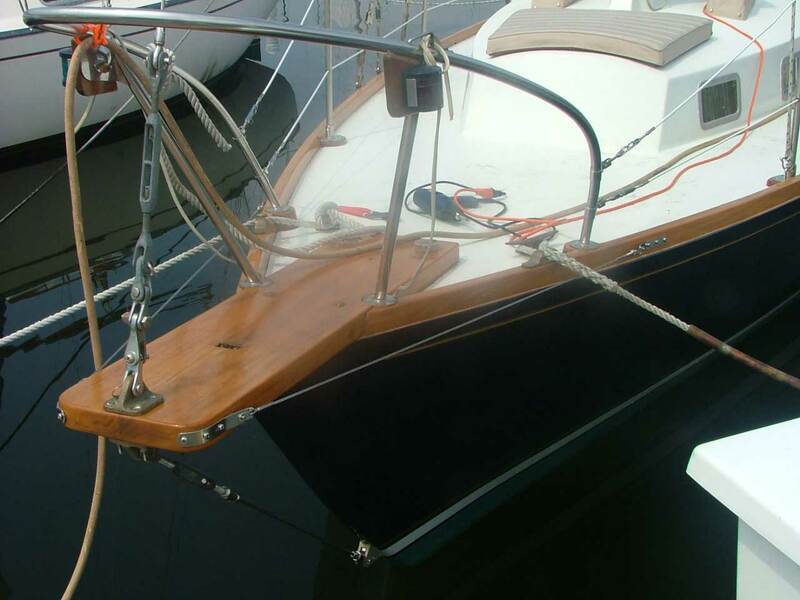 A bobstay will be added from the underneath tip of the bowsprit and attach near the waterline on the bow cove stripe. The stanchion bases, stanchions and lifelines are near completion. We are not going to go with a stern pulpit just yet. We can always add that later if so desired. 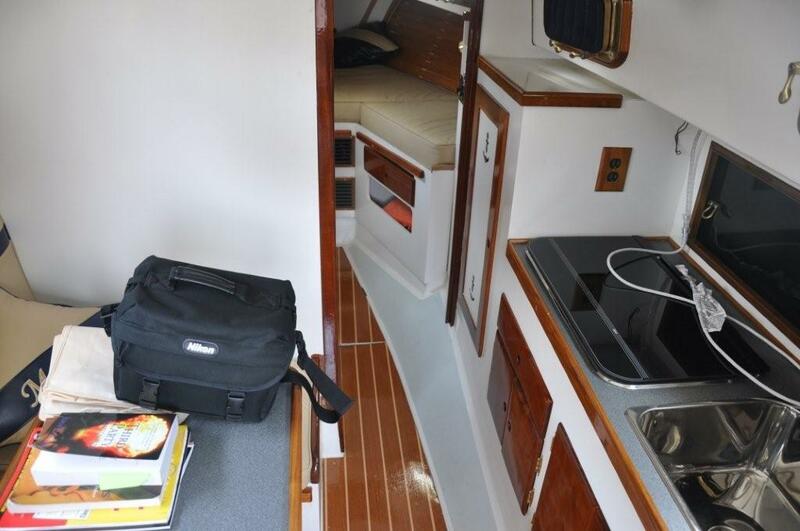 Another project planned is to cover the companionway top hatch and the aft hatch with strips of Ipe wood and black caulk seams in-between the strips of wood. They will also be cetoled with base coat and many coats of Cetol clear gloss. 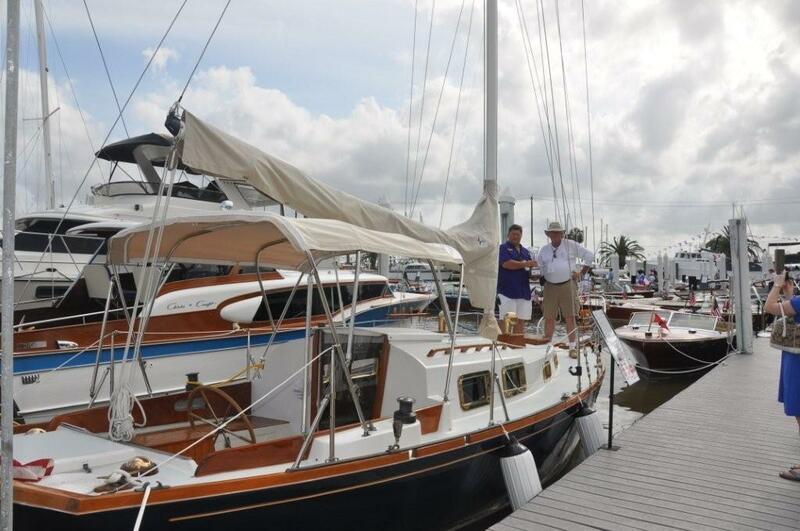 Steve Kahn writes in July that Maloha was recently hauled for a new topsides paint job using Interlux Perfection. It look just about perfect to me. The color is actually a very dark blue, like Flag Blue but appears black in this shot. Here's a clearer picture of her color. Note the gold sheer and cove stripes. I didn't have that much long term success with my B29's gold cove stripe. Gold tends to tarnish--or you have to clear coat it to keep it from tarnishing and that change the gold color slightly. Anyway, I hope the owners have better luck than I did with Awlgrip. Here she is back in her slip looking very pretty. 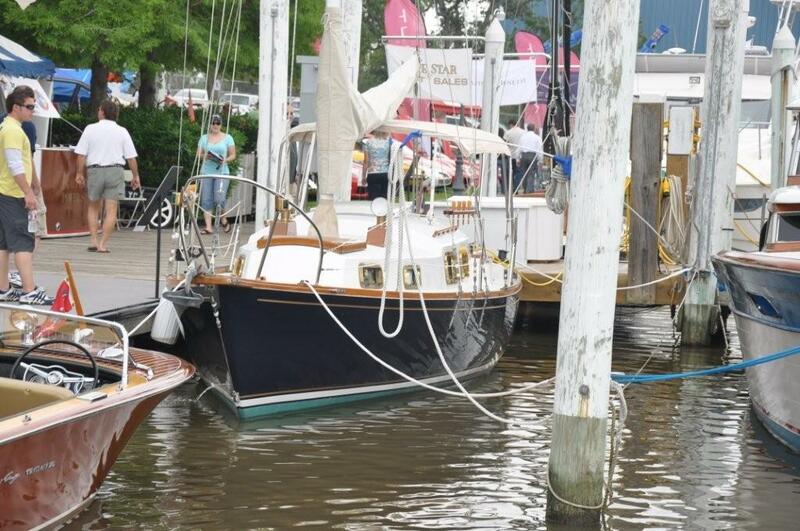 Notice the details on the bowsprit. I hope the owners will write soon with more details (hint, hint). She's a beautiful example of the Bristol 29. Here are the most recent completed projects to MALOHA. We just added stern graphics in GOLD LEAF with white outline and homeport. 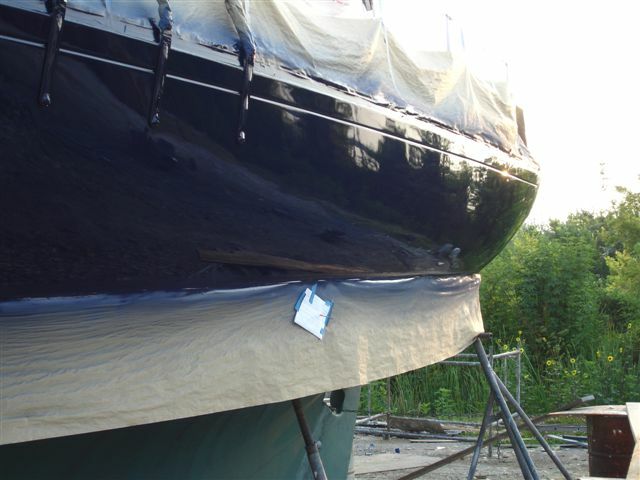 We have completed the Whiskers on the bowsprit for aesthetic reasons versus for structural strength. 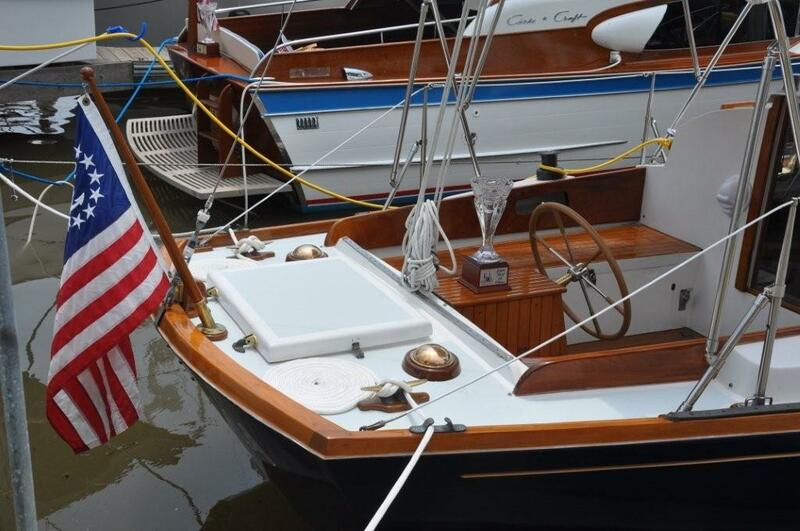 It gives the boat a more traditional look and protects the wood. Niels gets all the credit on this. Great Job! 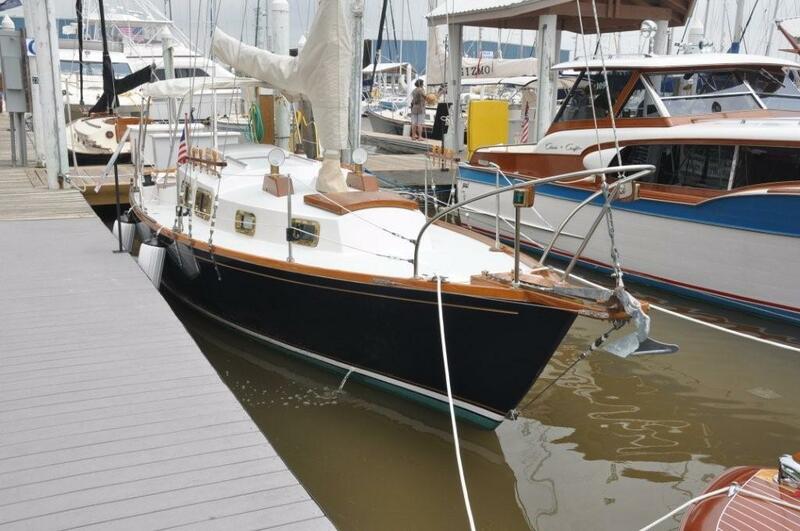 Will be working on repainting the deck next using a very light beige non-skid. 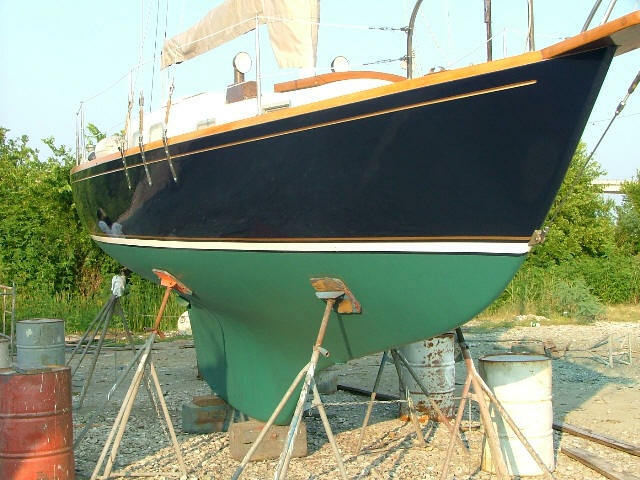 On the shrouds we will be adding varnished wood trim so that we can install belaying pins for an even greater traditional look. In addition, much, much more to follow. 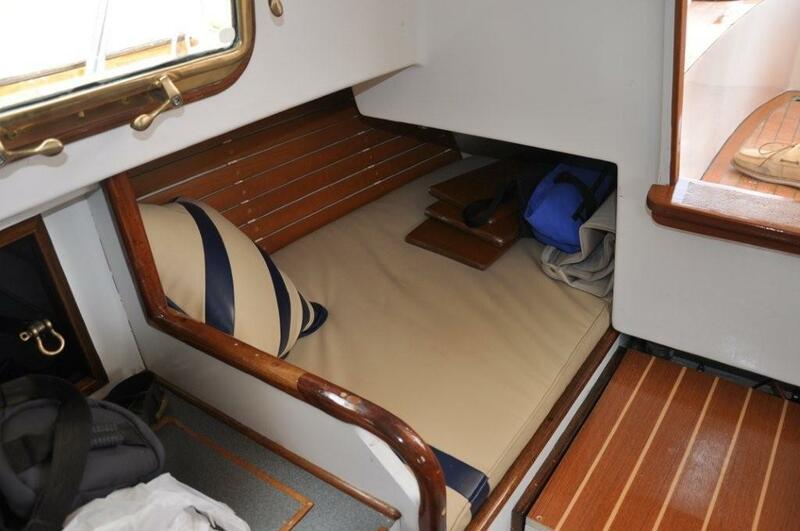 Stay tuned...After we build up the cruising boat kiddy, how about full opening BRONZE ports through out the cabin. That will happen in the future as well. Steve and Niels sent me some recent photos of their B29. 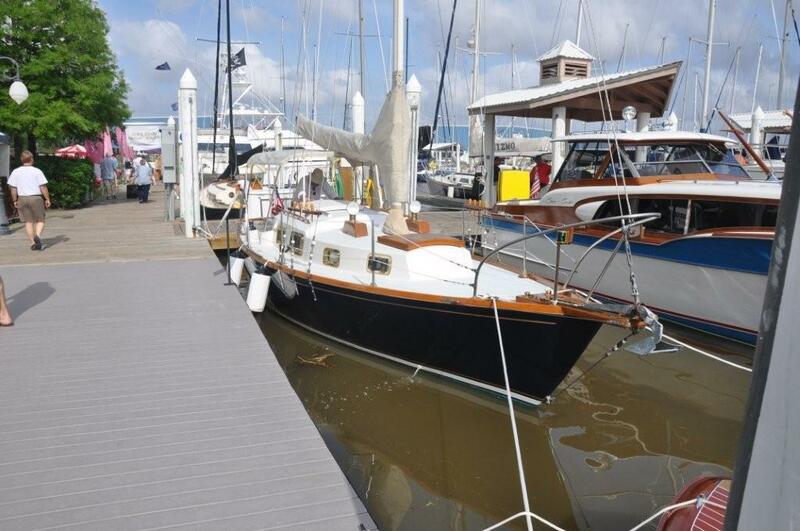 They have done a gorgeous job of restoring her.